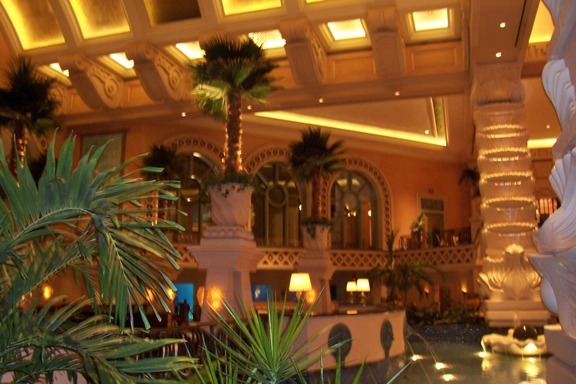 Dining options abound at the Atlantis Resort! For a relaxed or family meal, cheerful Bimini Road in the Marina Village serves a variety of popular dishes. Nearby, you’ll find Murray’s Deli, Carmine’s, and Johnny Rockets. Over at Harborside, enjoy The Point, an open air restaurant, and watch the ships sail by. In the casino, try Atlas Bar and Grill, and out among the predators and other sea life, have lunch at the Lagoon Bar and Grill. If you like a big buffet, be sure to try Market Place, Water’s Edge, or Mosaic. Ready to get dressed up and splurge? Step into a page out of the French Colonial era at the exceptional Café Martinique , even if only for drinks on the veranda. For carnivores, there are both the Marina Village’s SeaFire Steakhouse as well as the traditional elegance of the Bahamian Club. Over at The Cove, satisfy your longing for a spicy meal at Bobby Flay’s Mesa Grill. Or head to The One & Only Ocean Club for some exquisite French-Asian fusion at the fabulous Dune. Be aware that there is a 15% gratuity added onto all food at Atlantis in Bahamas, even the ice cream at Ben and Jerry’s. For city dwellers who generally give 20%, you’ll save money, and visitors from countries without tipping customs will be relieved at the convenience.